French romanticism is tested against Japanese sensibilities, as Noel has decided to play Cupid this week, in the name of furthering everyone’s favourite ship. After a quick encounter in which Noel meets the Lupinrangers as a member of the GSPO, he pickpockets Sakuya’s phone off of him, making Umika chase him to give it back. After the pair are gone, he remarks that he can’t help playing Cupid. This encounter leads to Umika discovering this week’s Gangler, Demeran, a classical capture-type Kaijin who catches people in some kind of flower pot. Sakuya tries to intervene but Umika is captured, and what follows is a series of sitcom-level shenanigans that prevent Umika from saving herself without revealing her identity as Lupin Yellow to her neighbours, Sakuya, or others. This allows Sakuya to play hero and get in her good graces. As part of this, he goes back to Jurer, apologises to Kairi and Touma, and then gets underway with the rest of the team. 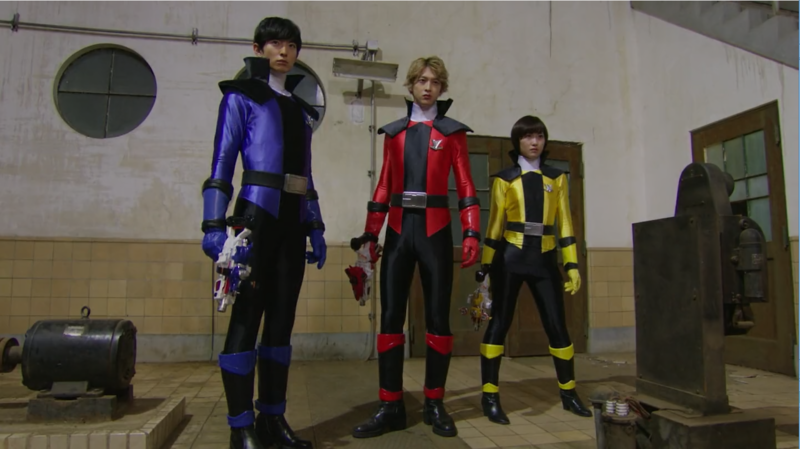 The other Lupinrangers spring into action as well, and we see a certain depth added to Noel as he begins to deeply regret pushing this. Demeran seems to have no motive other than capturing people, which is a bit sad due to the wasted potential there. The motivation could remain the same and the stakes raised dramatically if even a line about using the captured humans as food were to be added on. When not focused on Umika being inadvertently forced to play damsel in distress, we begin to see Noel and Sakuya’s resolve tested, as the two work side by side to save the trapped Umika and civilians. Their desperation shows as they try more and more drastic measures to get the situation under control, until they finally figure out a way to solve the problem. For all his regrets, though, Noel takes full ownership of the situation and maintains control throughout, showing his experience and expertise hiding beneath this goofy, light exteriour. Once the people are freed, the action is free to take a more dynamic turn, and the camera movements become far more erratic to reflect this. While not entirely subtle, it’s a nice change in pace as the whole episode begins to feel more frenetic and action-packed, even for as brief as the sequence is. 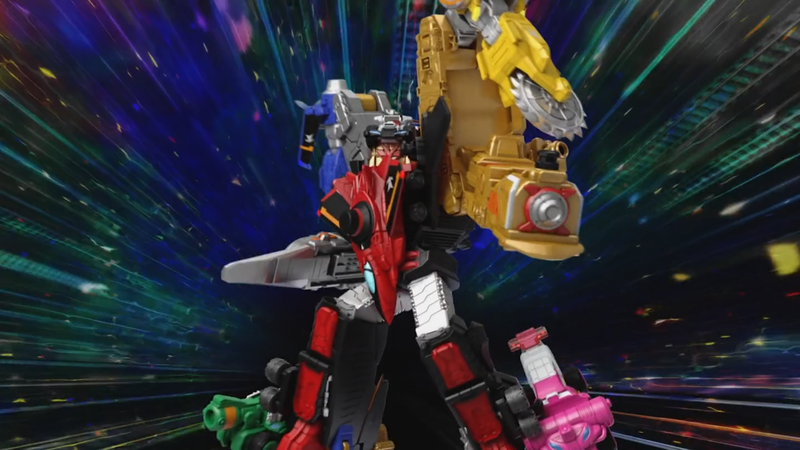 Overall, another excellent entry this week, including the debut of X Emperor, Noel’s custom mecha sets up a few things to come. With Noel’s X Emperor having two forms to start, like the man himself, it leads to possible combinations with both teams in different ways. X Emperor Blade could combine with PatKaiser, or X Emperor Gunner with LupinKaiser, just for the sake of inversion of expected pairings. Noel and Sakuya play off each other well, and I can easily see them beginning to work as a buddy-cop duo a la Starsky and Hutch or CHIPS. The two are already growing close, and may continue to do so as they form an almost brotherly bond. The preview for next week shows a cooking contest, allowing Chef Touma to shine. If Noel is a con man, he is certainly playing the long game. This week, we see Noel’s allegiance tested, and learn a little more of his back story, as both Good Striker and Kogure acknowledge him as a long-time friend and servant of the Lupin family in France. The police are hesitant to trust Noel, and even the Ganglers are confused by his duality, though they seemingly do not know that Lupin X and Patren X are the same person. For much of this episode, we see Noel begin to form his plan, playing both sides off of each other to strengthen his own position, including hand-delivering last week’s Lupin Collection item to the thieves, before later trying to steal another to make the police trust him. Tsukasa, ever the observant one, is hyper vigilant around Noel, though she is as reserved with her mistrust as Keiichiro is open. The leader and the newcomer fit together like water and oil, even after Noel has shown that he can be trusted, due to Noel operating on a different mission and different chain of command. There are two sequences in this episode of seemingly-invincible enemies, first with the Gangler of the week, and second with Noel himself. The Gangler adopts a Chrome form, hardened like metal, and stands still tanking hits while Kairi is able to his item. Noel, however, is not such an easy opponent and projects a force field on every hit the thieves manage to land while in his Lupin X form. 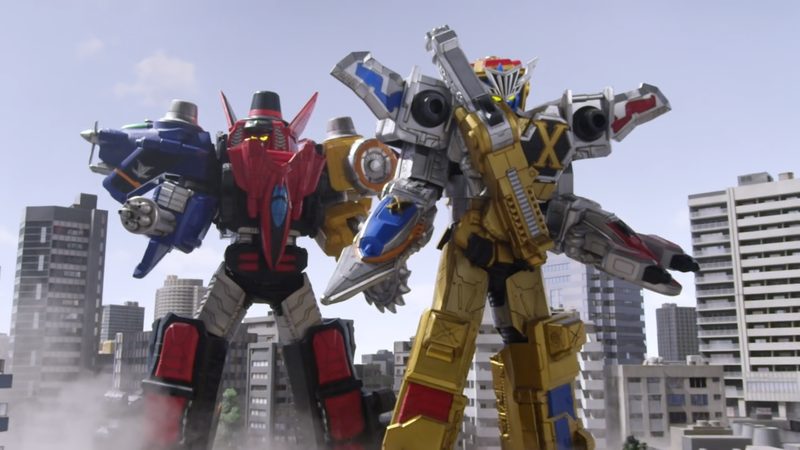 Patren X is not shown to have the same ability, but does make an appearance in battle for the sake of dramatic flair and presenting a consistent image to the other Patorangers. In this episode, we also see the first appearance, but definitely not the last, of PatKaiser Trains form, which is similar to the way Noel’s train items combined with LupinKaiser last week. 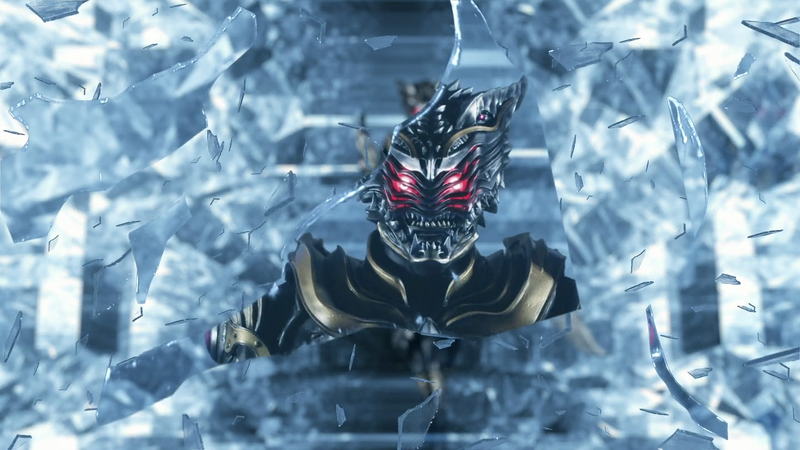 Noel, himself, again remains in a train car at vehicle size, though the gold train is shown to be equipped with some kind of energy weapon that he can use against Kaiju. In the end, his motivations remain unclear and both sides remain suspicious of Noel, though the thieves seemingly have more reason to trust him now. As the episode ends, Noel and Kogure are seen walking along a Tokyo street, with city lights for a backdrop, and Noel tells Kogure they need to talk. The implication is something dark and scandalous, but we will need to wait to find out. The preview for the next episode indicates that the French romantic in Noel will come out, as Sakuya decides to finally take his pursuit of Umika’s affection a step further. Seeing this as a positive, it seems Noel will push them both further together and help Sakuya along with a bit of traditional French romanticism and the ideals of love. 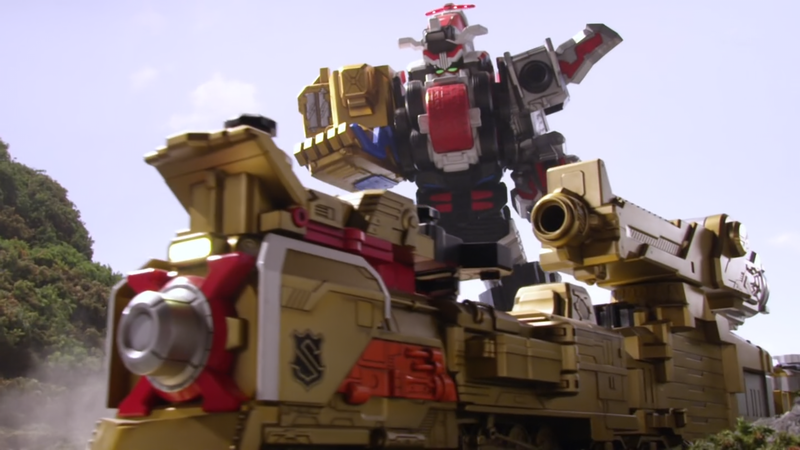 What did you think of this week’s Lupinranger Vs Patoranger? Who do you think Noel is really working for?Leave a comment below and let’s discuss! 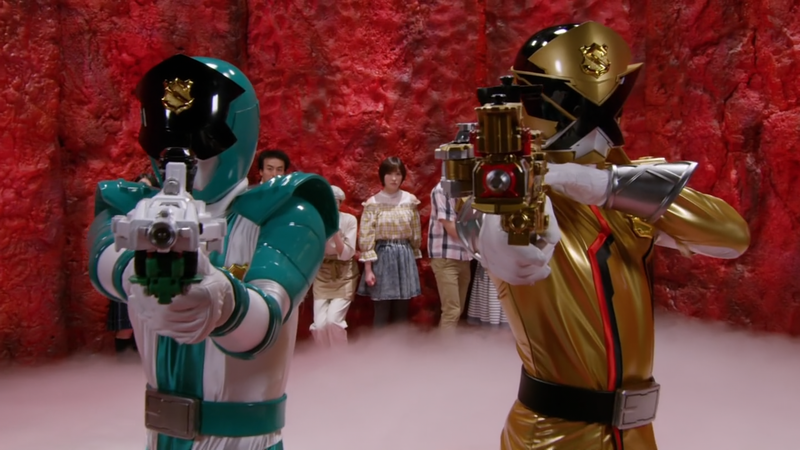 As is tradition, Lupin X is made out to be invincible, and takes the new Gangler’s item effortlessly using a number code, as opposed to the traditional spinning lock the other Lupinrangers have. 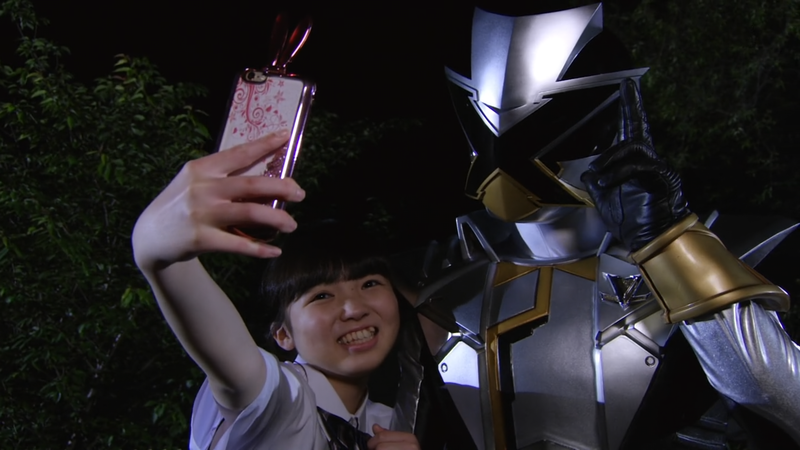 He is clearly a light character, even going so far as to take a selfie with the girl he rescues. 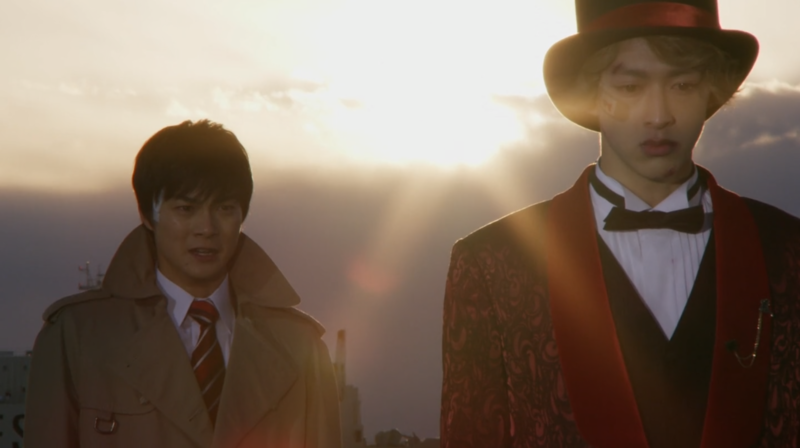 Interestingly, though, Kairi is just as shocked as Keiichiro to learn of the existence of Lupin X. Thankfully, he doesn’t need to wait long for an answer. He’s brash, full of energy, and big on theatrics, including a demonstration of athleticism. In the midst of a show of backflips, Lupin X steals the phones of everyone nearby, openly declaring that he is Lupin X before he passes phones out back to their respective owners. Keiichiro arrests him on the spot. Before departing, Lupin X leaves his calling card on Kairi’s phone. Lupin X is called Takao Noel, and makes a joke and a show even of just telling the police about himself. He is consistently, and fittingly, dramatic while also being lighthearted and a bit fun. It seems only Commander Hilltop knows, though, that Noel is a deep cover agent transferring in from the French HQ of GSPO. Keiichiro immediately takes a strong and hilarious dislike to Noel, setting up some of the best jokes of the episode. Despite all his theatrics and silliness, though, it is revealed quickly that Noel is an engineer, and a brilliant one at that. 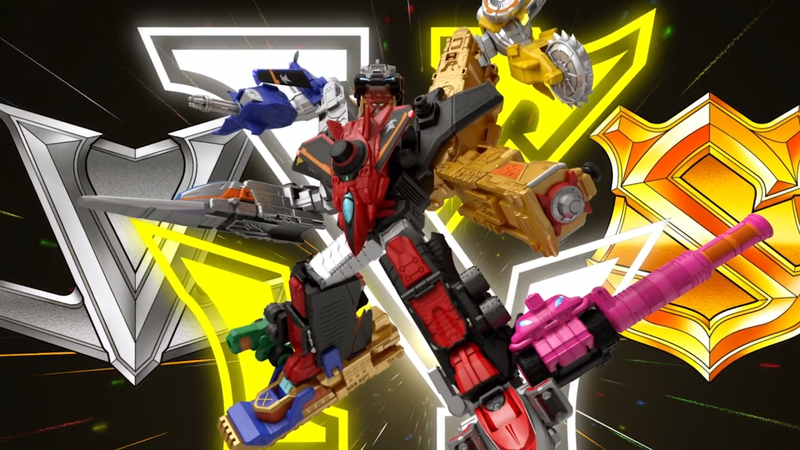 Noel is the creator of the VS Changer system, and even went so far as to design his own changer that allows him to become Lupin X and Patren X at the flip of a switch. As is fitting for a debut of a new hero, Noel is easily the best part of this episode. His movements in battle are acrobatic and draw the eye in much the same way that movies featuring Bruce Lee or Jackie Chan do. His motivation is selfish in the end, and the brashness he displays even brings out new traits in the other characters, as confusion gives way to fear and fear, in turn, to anxiety. Touma even goes so far as to raise his weapon as he declares that Noel is a threat. To me, at least, this seems to be a hint that Touma would not be above killing Noel in the end, if it meant that the Lupinrangers could accomplish their goals. This mistrust is quickly swept aside when Noel allows his own VS Vehicles, X-Train Silver and X-Train Gold, to combine with Good Striker to create a new form of LupinKaiser. As his price, Noel claims a temporary leadership role on the team. After this, it is the police who are quick to doubt him. They question his motives, understandably, and when the thieves return to Jurer, they find Noel already waiting. Overall, this episode is fantastic. The whole dynamic of the show’s previous cat-and-mouse game is instantly turned on its head by the arrival of brash, bold Noel Takao, and I cannot wait to see what more he can bring to the table as the two teams begin to question himself, themselves, and each other. Noel clearly has a much bigger part to play that has yet to be revealed, but we will have to wait to see where that comes from and how it plays out. What did you think of this episode? Leave a comment below and let’s discuss!